Thank you! Great pic . Another gorgeous pic, thanks DSP. Thanks DSP fir another great picture and I haven't seen that quote before. It was a quote from an ELLE Spain interview (in Spanish). Thanks DSP. Obviously one that passed me by. Thanks DS_P! Another great photo, so many to choose from! Thank you,thank you, thank you!!! Oooops… Totaly forgot the July calendar! 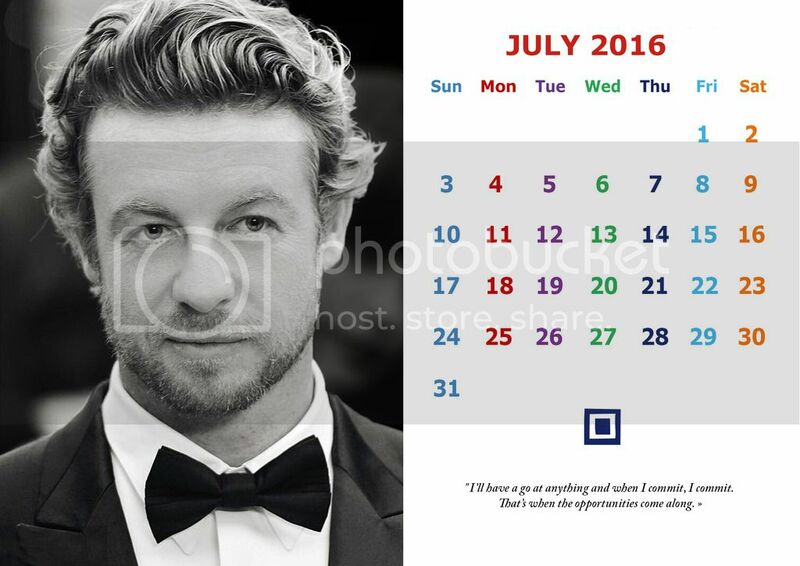 Here now the JULY 2016 Calendar! Click on the image here below to get the link to the photobucket page where you can donwload it in full size. On the upper right corner of the image, click on the little wheel icon (last on the right), in the drop-down menu, choose "download". Thank you Marie! Such a beautiful pic, isn't it!?! Thanks DSP, I agree Tina...a beautiful pic indeed! Thanks Marie! He's always worth the wait! Thank you!!! Great photo choice!! For those who want, the AUGUST 2016 Calendar! I've changed the host for mypics. Clic on the vignette or on the link below to have the image full size (2000 x 1414 pixles). When on the hostingpics page, copy the image or simply drag it to your desktop. Thank you very much! It's a very good pic and I also like the quote!